We just passed the halfway mark in the year and now is an ideal time to revisit your New Year’s resolutions, to get back on track if necessary. How are they working out? Are you closer to achieving your goals? Resolutions, or lifestyle changes, are hard work. But they are attainable. We are all capable of achieving success. The only thing holding us back is ourselves. Once we achieve our goal, the more challenging part of the journey is maintaining the goal. According to a December 13, 2013 study published in the University of Scranton’s Journal of Clinical Psychology, 8% of people are successful in achieving their New Year’s resolutions. The same study showed that 75% of those people maintain their resolution through the first week, and 46% maintain their resolution past six months. Here is my getting started question. Who decided that I must go by the calendar year, or January 1, as the start of my new year? In my opinion, every day is an opportunity to start a new year. 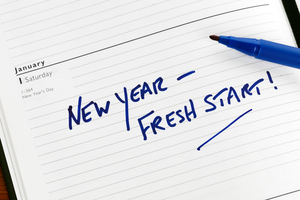 2015 is not a leap year, so we all have the same 365 days for a new beginning – for moving forward. So instead of “waiting until next year” to start over if I stumble early on, I can make a fresh start that same or the following day, week, or month and see where I am at a year from that date. So, let’s get started. First, I must make an effort to change something that I can actually change. In the words of my friend Lynn M., “Control the controllable.” For example, I cannot change the fact that I am HIV-positive. However, I can change countless lifestyle variables or co-factors that affect my health, will enhance my happiness, and improve my overall well-being – such as a new platform for my life’s purpose, stress reduction, improved nutrition, sleep, and more. Here is my five-step action plan on getting started, and more importantly staying motivated, in attaining my personal goals. First, identify that which I can change. Second, I must take that first step – the hardest step. Third, keep it simple and fun. If I am not enjoying what I am doing, what is the use? Fourth, keep it specific and attainable. Fifth, reward myself along the journey. Knowing me, most likely I will stumble somewhere along the way. In fact, I am certain that I will – more than once. However, that’s okay! No guilt. No sense of failure. It does not have to be all or nothing. I’m not a believer in perfection, as I believe that there is always opportunity for growth. I frequently share with others that as difficult as it may be to stay on track, it’s a lot harder to fall off and try to get back on. I truly believe that we can all overcome and grow from obstacles when we learn to see them differently. Challenge yourself to move forward, instead of holding back. Go ahead and take that first step – the hardest step. See where you are on January 1, 2016 or YOUR New Year! Believe in YOU, like I believe in YOU! After attending a webinar on the sentencing of Michael Johnson to 30 years in prison, who was convicted on five felony counts – one count of recklessly infecting a partner with HIV and four counts of recklessly exposing partners to the virus – I decided to do some research on HIV criminalization. It turns out that when the Ryan White Comprehensive AIDS Resources Emergency (CARE) Act was implemented in 1990, it included a requirement that states, in order to receive funding for AIDS treatment and care, had to have laws that could prosecute any HIV-positive individual who knowingly exposed another person to HIV. Although this requirement was removed in 2000, some states still have HIV criminalization laws. Massachusetts, in particular, doesn’t have an explicit HIV-specific criminal statute – but it does have a broad STI sentence enhancement law that has been applied to HIV. Of recent HIV criminalization cases, about 25% of them were for biting, spitting, or scratching, which are actions that do not transmit HIV. 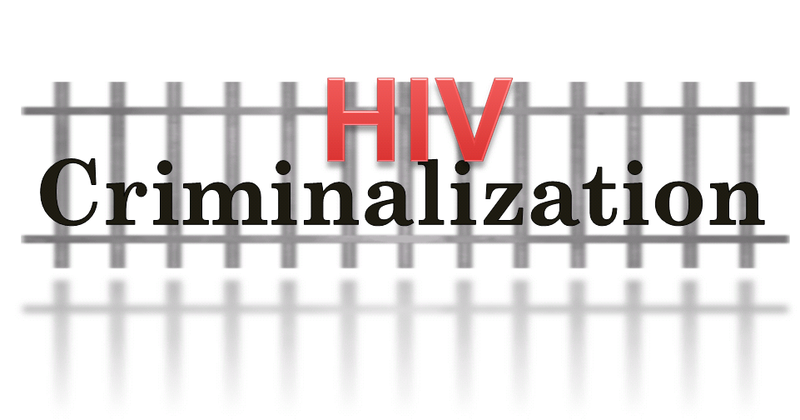 Considering that the intent of HIV criminalization laws would be to protect people, it seems like a misuse of resources to prosecute people based on an action that would not and could not harm anyone by transmitting HIV. Keeping these laws indirectly encourages misperceptions about HIV risk and transmission and increases stigma against people living with HIV. This runs counter to all of the progress that’s being made by agencies like the BLC to decrease stigma, promote HIV testing, and engagement and retention in care – to decrease the number of new HIV infections – and really isn’t a constructive way to promote public health. I want to offer a quote from the National HIV/AIDS Strategy for the United States, an HIV/AIDS policy document published by the White House – which I actually read through on my very first day as an intern for the BLC. It states that “the continued existence and enforcement of these types of laws run counter to scientific evidence about routes of HIV transmission and may undermine the public health goals of promoting HIV screening and treatment.” The new HIV/AIDS Strategy for the United States will be released this month, on June 30th, following its last publication in 2010. I hope that it will place greater importance on updating HIV criminalization laws around the country in order to achieve the three goals outlined in the National HIV/AIDS Strategy for the United States: reduce new HIV infections, increase access to care and improve health outcomes for people living with HIV, and reduce HIV-related health disparities. Updating these laws to reflect the truth could reduce misinformation and decrease stigma – which could make people more willing to be tested, leading to fewer new HIV infections. Hi! Caitlin here, the BLC’s Prevention and Education Specialist. I asked our summer intern, Julie, to reflect on an assignment that she had to complete as part of her internship – Julie recently hosted a seminar for her cohort here at the BLC and presented to them on what we do here. I asked Julie to tell us about it. Here is what I asked: Post about your experience having your seminar at the BLC – what did you present to your cohort? What were your peers’ reactions to the BLC? What did they learn? What did you learn? Each week during my summer internship through the Boston Community Health Program, the other students in my cohort and I gather for a seminar at one of the internship sites. During these seminars, two students present on the agencies where they are interning for the summer and educate the rest of the cohort on what they are learning and how they are contributing. Last week, the BLC hosted the 7 other students in my program. I gave a presentation about the state of HIV/AIDS in the U.S., about what we’re doing at the BLC, and a little about my experiences here so far. Thank you to Morrigan for staying late to host us! While I was working on the first part of my presentation – about the state of HIV/AIDS in the U.S. – I realized a couple of things. I realized that I had learned a lot in the short time I have been here about HIV/AIDS – about the history of the epidemic, of the way it disproportionately affects certain populations, what T-cells or CD4 cells are, what antiretroviral medications are, and what terms like “virally suppressed” and “engaged in care” or “retained in care” mean. I also realized that I really had no idea what my fellow interns knew and hadn’t known about HIV. Looking back on it, I wish I had given them a questionnaire beforehand so I could gauge how much they knew. Having been born after the epidemic came about, I assumed they knew basic facts about how HIV affects the immune system and how it is transmitted from person to person, but my guess is that they didn’t know very much about the populations most affected. My peer students were very engaged in my presentation about the BLC and asked some very insightful questions. Some of the questions were ones that I didn’t fully have the answers to, such as why exactly HIV affects certain populations so disproportionately, and what holistic care – which is something we promote at the BLC – really means. So I was thankful that Morrigan was there, because she was able to answer questions that I couldn’t. It turns out that holistic care looks at the patient “as a whole,” or as a person with physical, spiritual, psychological, and social aspects of their lives. I found myself learning new things even while I was giving my own presentation! I think that my fellow interns learned a lot about HIV/AIDS from both me and Morrigan. But I hope that they also considered how complex caring for someone can be when the illness can’t be treated by one operation but rather requires someone to adhere to daily medication regimens – especially when that person has a lot of other things they’re struggling with such as homelessness, substance abuse, or food insecurity. I also hope that walking into this building and seeing the dining room, library, art studio, etc., made them realize how helpful a caring and supportive community can be. I’m glad that I was given the opportunity to share with my peers a bit of the amazing things that happen here at the BLC, and I’m glad that I was given the opportunity to contribute. Meet our new summer intern, Julie! Julie is an intern at the BLC for the summer of 2015. Hi everyone! I’m excited to be here at the Boston Living Center. I grew up in Chicago and am a rising sophomore at Dartmouth College. This is my first time living in Boston and I’m enjoying being a tourist here. In my free time, I like to read, ride my bike, go to concerts, and eat! I am interning at the BLC through the Boston Community Health program at the Tucker Foundation for service, spirituality, and social justice. This program places 8 students at healthcare-related agencies throughout the Boston area and I was fortunate enough to have been placed at our wonderful BLC! I have been learning a lot about the healthcare system in Boston from my fellow interns as they tell me about the organizations they have been interning with. We’ve all been surprised by how many different aspects there are to healthcare that we hadn’t considered much before – like housing and nutrition. At Dartmouth, I am majoring in Biomedical Engineering. I’m especially interested in technological advancements in healthcare, so I’ve been fascinated by the discussions I’ve had at the BLC about medications and current research. I hope that my time at the BLC will introduce me to some of the obstacles to improving health care, especially those beyond a primary care setting. I am sure that the BLC, with its dedication to support and education, will be a fulfilling experience. I would also like to get to know some members and to have felt like I have made a positive impact during my internship. I look forward to the rest of the summer here at the BLC!